Product prices and availability are accurate as of 2019-04-03 09:23:18 EDT and are subject to change. Any price and availability information displayed on http://www.amazon.com/ at the time of purchase will apply to the purchase of this product. 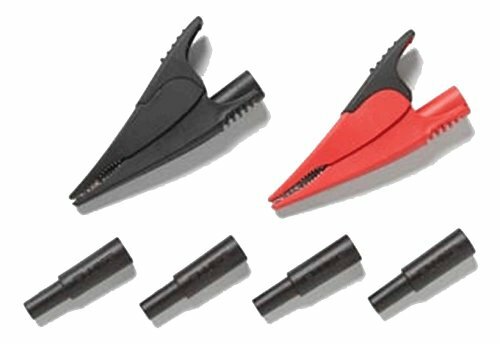 Includes model a pair of red and black extra large alligator clips plus adaptors to securely attach the alligator clips to Fluke fused test probes FTP-1, FTPL-1, FTP and FTPL. SureGrip has rubber overmolded surfaces for a firm reliable grip. Multi-purpose tooth pattern grips anything from fine gauge wire to a 20mm (0.75") nut. Strong, nickel-plated steel jaws for a tight hold. Conforms to safety standard IEC61010-031:2002 +A1:2008, CAT III 1000V, CAT IV 600V. 10A maximum, pollution degree 2, 2000 m altitude. Operating temperature: -4 to 131 degree F, 95 percent RH. One-year warranty.